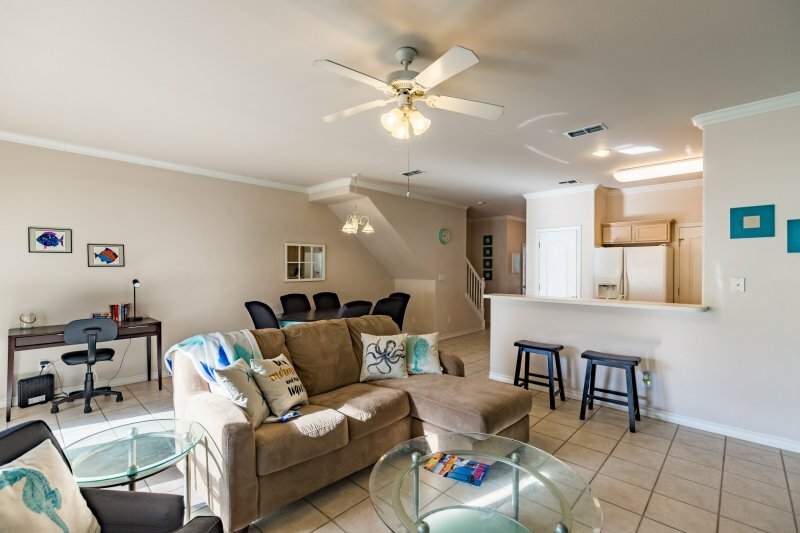 Pack your days with Gulf Coast adventures at this 3BR/2.5BA townhouse in North Padre Island —you’ll find everything within a short walk or drive. Stroll a half-mile to picturesque Whitecap Beach. 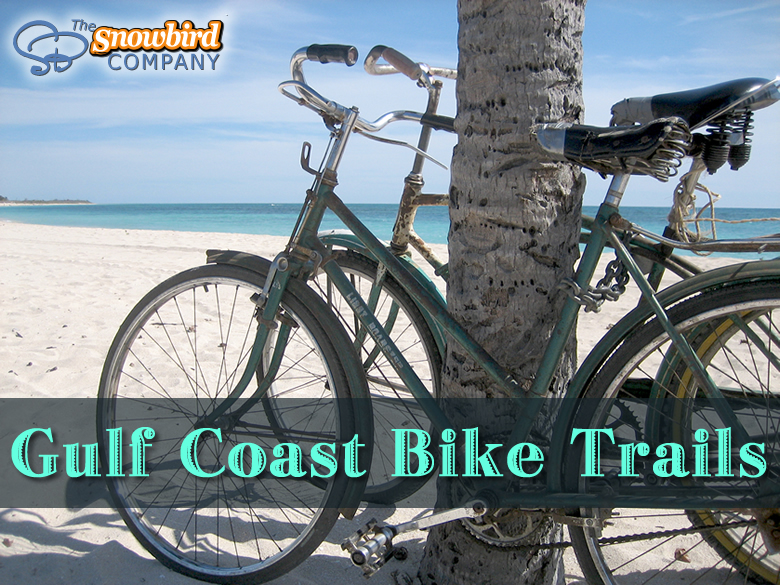 Or drive less than 10 minutes to area attractions including Schlitterbaun, Packery Channel, Bob Hall Pier and JP Luby Surf Park. 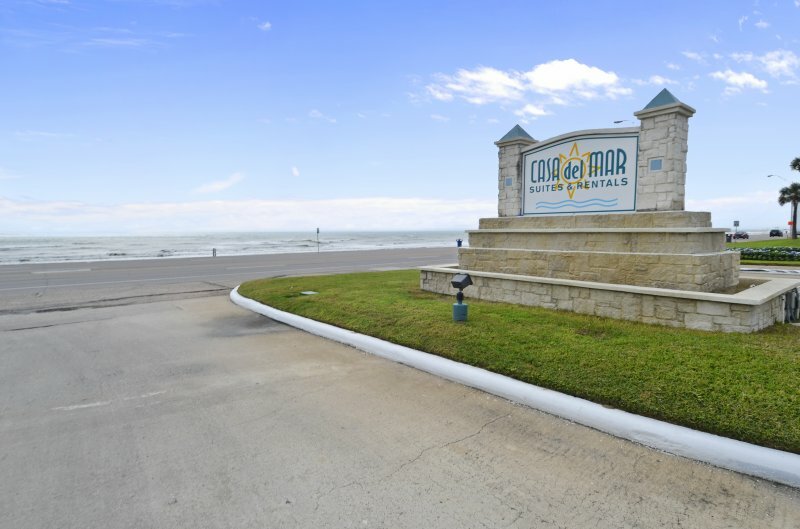 Local eateries, nightlife, and shops are just a couple of minutes away. Or stay close to home and relax at the shared on-site pool. Traveling with a larger group? There are three other rentals available at this same resort; contact us for details. A wall of windows, an open floor plan, and tiled floors bring a light feel to the main living area. A desk offers a handy spot to check email. Curl up on the L-shaped couch or armchair. 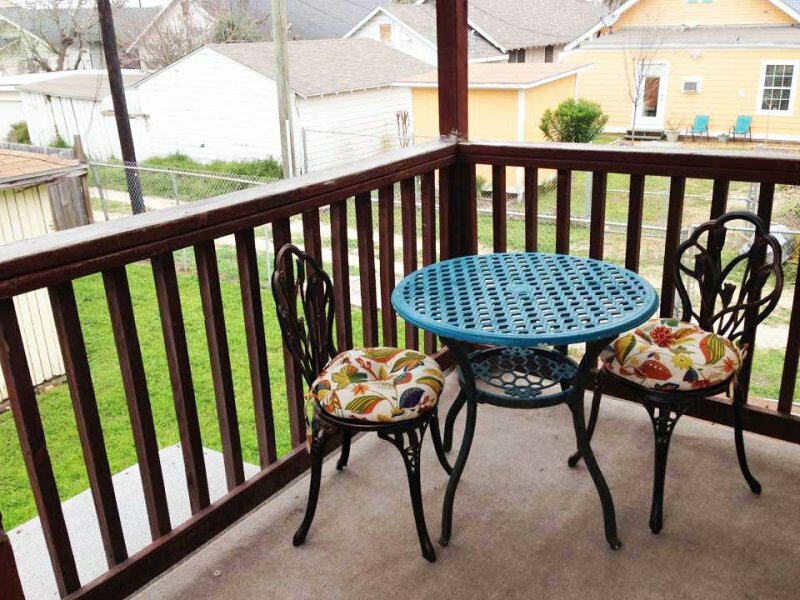 Watch the 36” flat screen TV with DVD player, or soak up the sun outdoors on the patio. 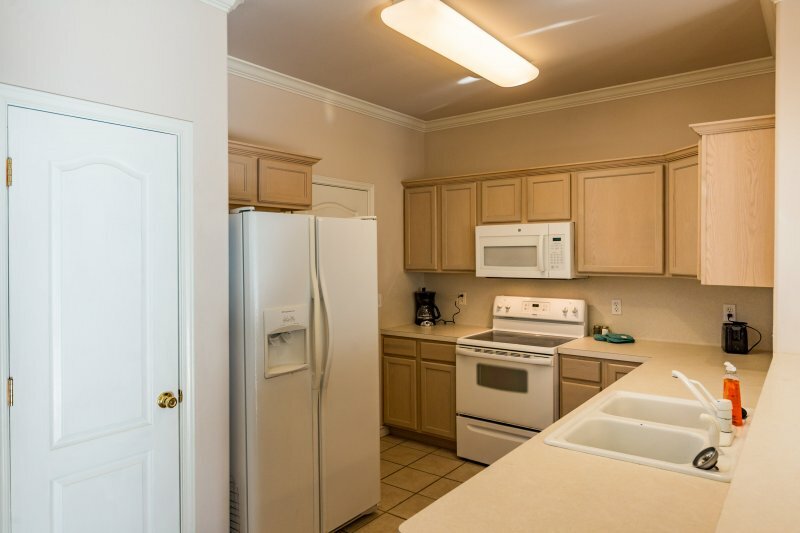 The well-equipped kitchen features a full suite of appliances, including a French door fridge. Grab breakfast on the go at the four-person kitchen bar. In the evenings, there’s seating for six to share meals around the dining table. Upstairs, a quiet sitting area has a twin daybed with twin trundle—it’s ideal as an extra sleeping space or cozy reading spot. Doors open onto a sunny deck. Sleep soundly in the master bedroom on the king bed with luxurious Beautyrest mattress. 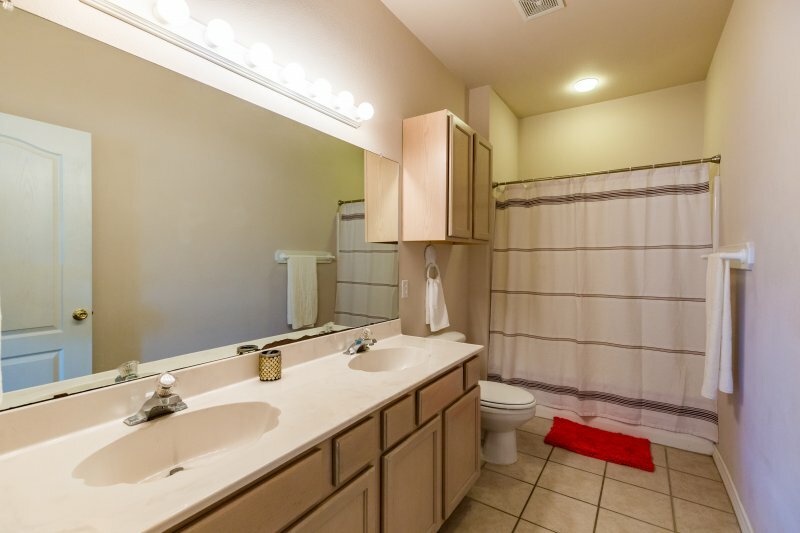 This room also has a large walk-in closet, and an en suite bathroom with a dual vanity and tub/shower combination. 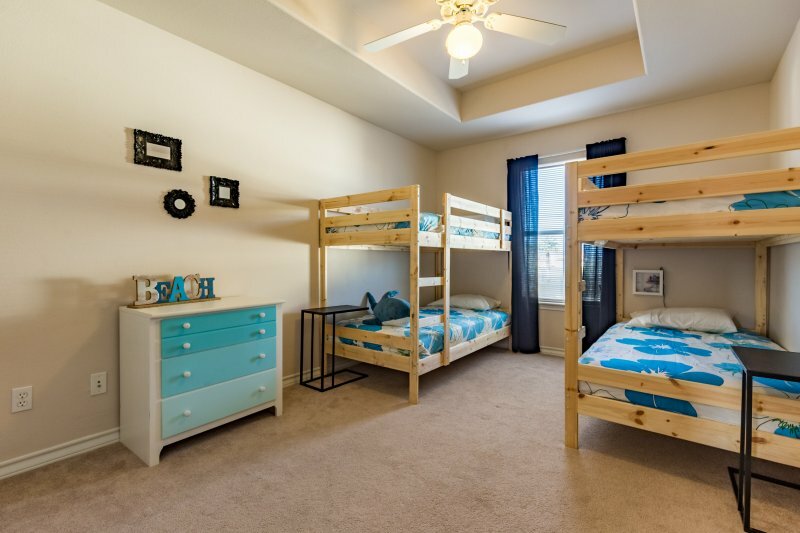 Perfect for kids, the second bedroom comes with two twin-over-twin bunks and a walk-in closet. 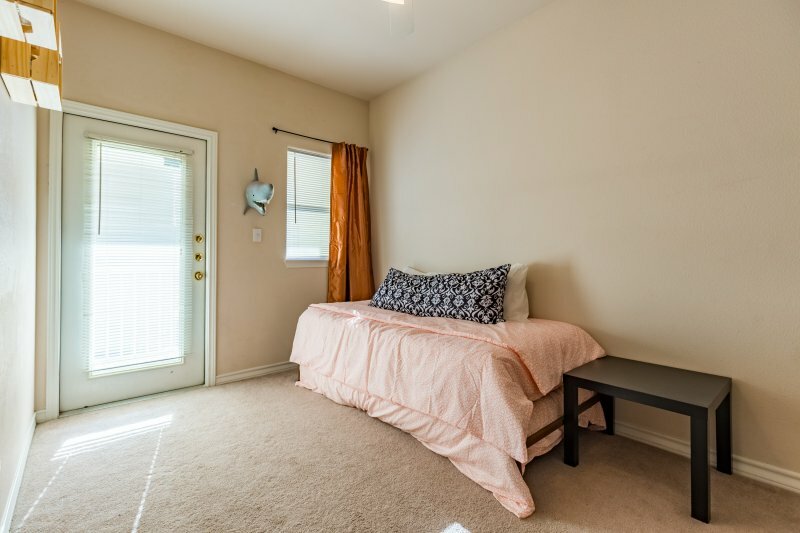 A third bedroom offers a walk-in closet and a full-size bed with a comfy memory foam mattress. A guest bathroom has a tub/shower combination, and there’s also a half bath on the entry level. underneath great for kids or adults. Also a pack n play and booster seat are in the unit for our tiny guests! 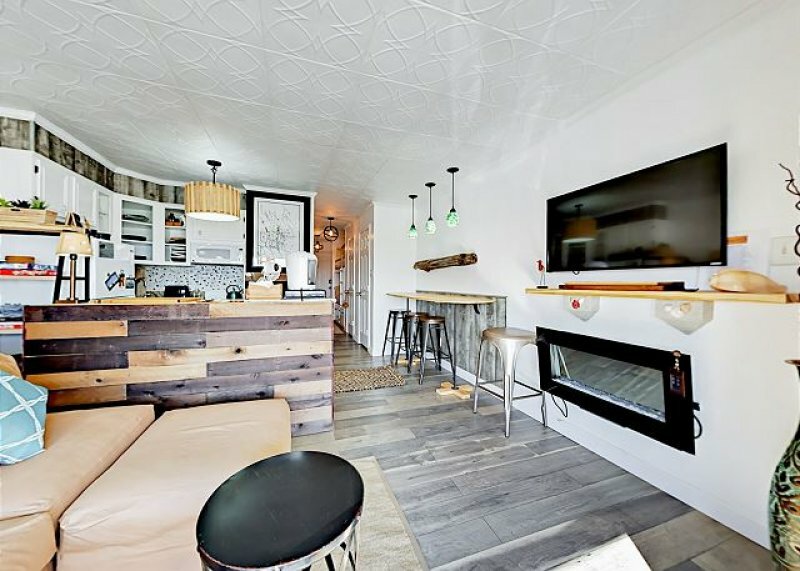 Amenities include complimentary Wi-Fi, cable TV, and a washer/dryer. Parking is available for three cars. Stroll 10 minutes and perch yourself on the sandy shores of Whitecap Beach. Or drive 7 minutes and spend the morning wildlife-spotting and strolling the boardwalks at Packery Channel Park. Just 8 minutes away, JP Luby Surf Park offers a haven for surfing, kiteboarding, and wakeboarding. While Bob Hall Pier (a 6-minute drive) offers a gorgeous spot to catch the sunset. 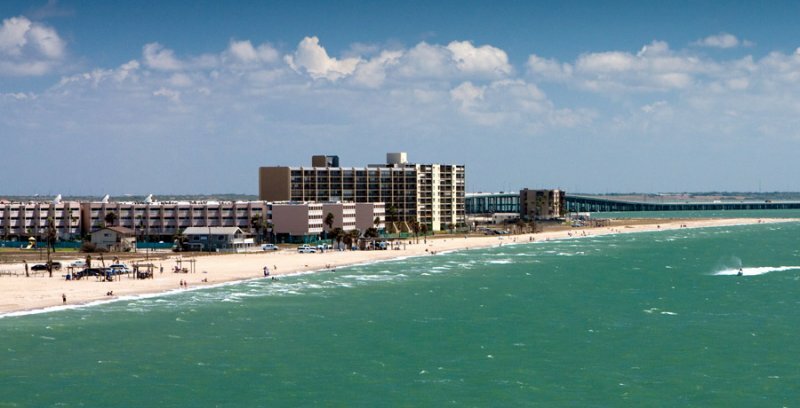 For an adventure-filled day, check out the waterslides at Schlitterbahn (a 7-minute drive) or travel 17 minutes to explore Mustang Island State Park - one of numerous coastal parks in the surrounding area. Local dining options are right on your doorstep. Walk 5 minutes to the waterside sports bar, Boathouse Bar & Grill. Or drive 3 minutes to Costa Sur Wok & Ceviche Bar for Peruvian dishes, seafood and cocktails. JB's German Bakery & Cafe is a great spot for breakfast - also a 3-minute drive. Prices do not include taxes, a damage protection fee (dependent on length of stay $69-$250), and a $145 cleaning fee. Please feel free to contact the owner for last minute discounts and deals. 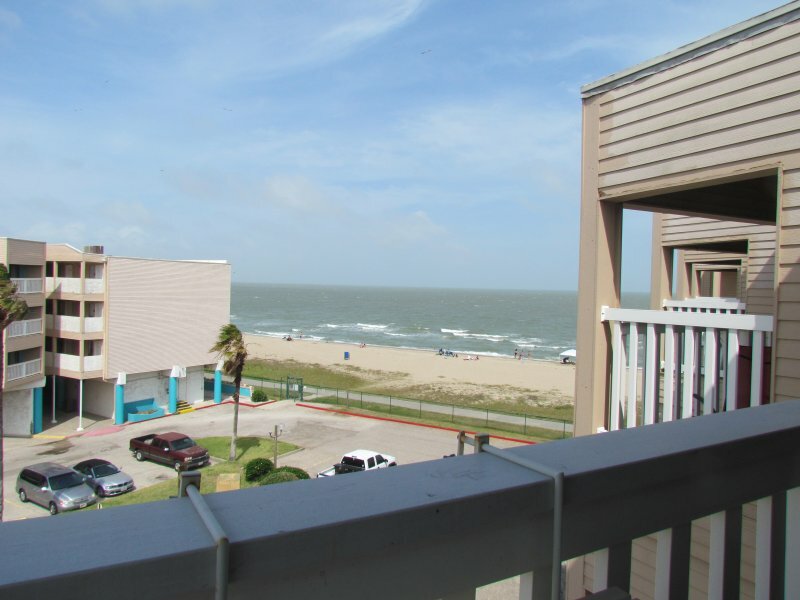 Description 3BR/2.5Bath w/ Pool – Walk to Beach, Short Drive to Schlitterbaun Waterpark Pack your days with Gulf Coast adventures at this 3BR/2.5BA townhouse in North Padre Island —you’ll find everything within a short walk or drive. Stroll a half-mile to picturesque Whitecap Beach. 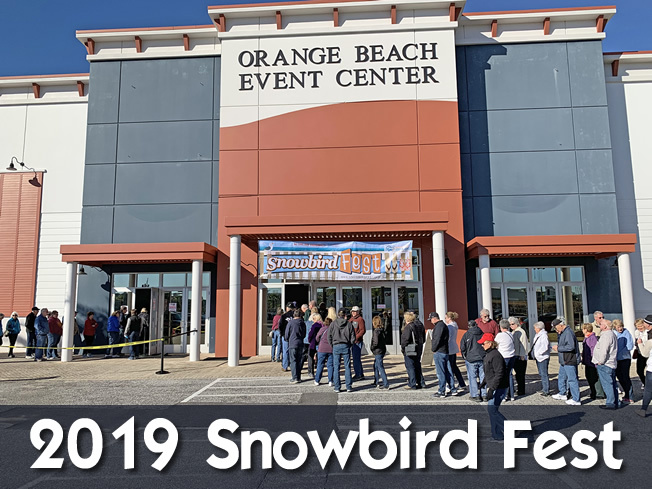 Or drive less than 10 minutes to area attractions including Schlitterbaun, Packery Channel, Bob Hall Pier and JP Luby Surf Park. 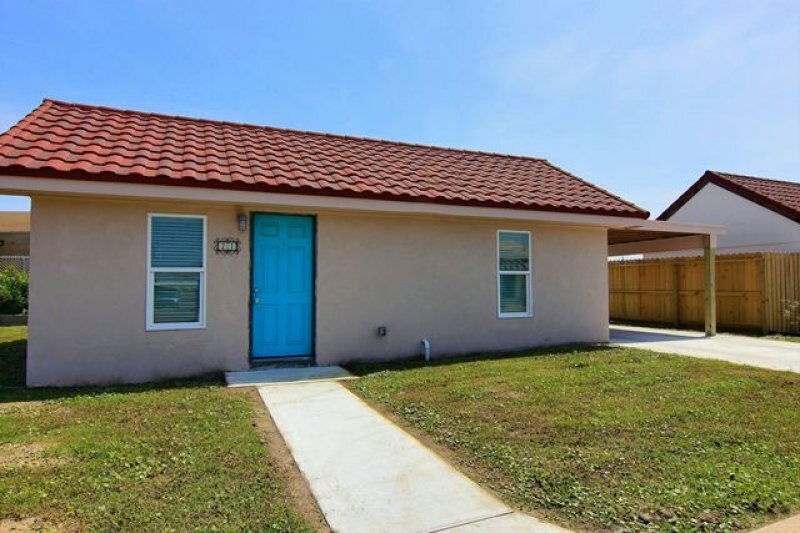 Local eateries, nightlife, and shops are just a couple of minutes away. Or stay close to home and relax at the shared on-site pool. Traveling with a larger group? There are three other rentals available at this same resort; contact us for details. ABOUT THE HOUSE A wall of windows, an open floor plan, and tiled floors bring a light feel to the main living area. A desk offers a handy spot to check email. Curl up on the L-shaped couch or armchair. 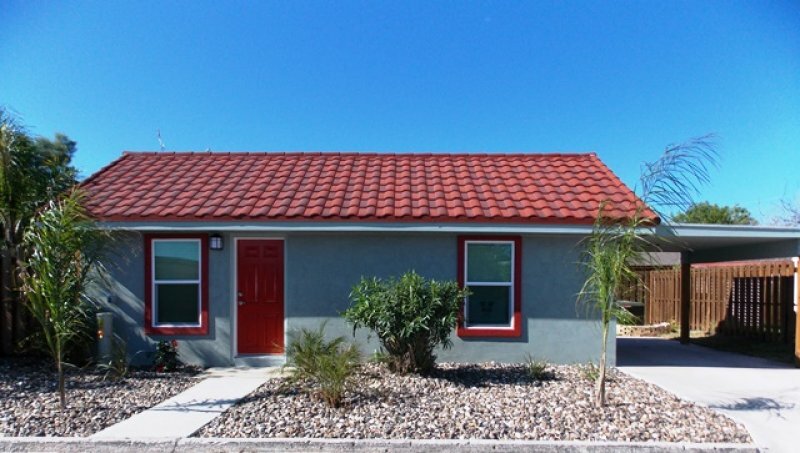 Watch the 36” flat screen TV with DVD player, or soak up the sun outdoors on the patio. 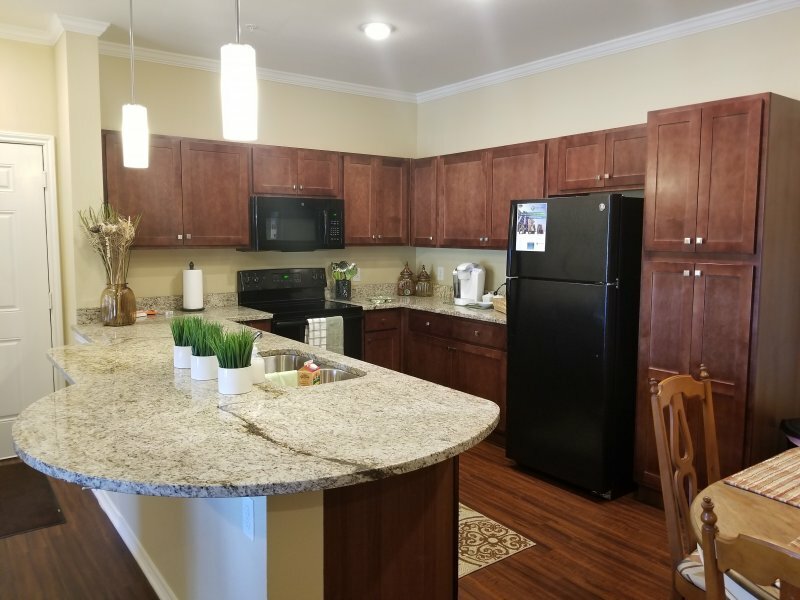 The well-equipped kitchen features a full suite of appliances, including a French door fridge. Grab breakfast on the go at the four-person kitchen bar. In the evenings, there’s seating for six to share meals around the dining table. Upstairs, a quiet sitting area has a twin daybed with twin trundle—it’s ideal as an extra sleeping space or cozy reading spot. Doors open onto a sunny deck. Sleep soundly in the master bedroom on the king bed with luxurious Beautyrest mattress. This room also has a large walk-in closet, and an en suite bathroom with a dual vanity and tub/shower combination. 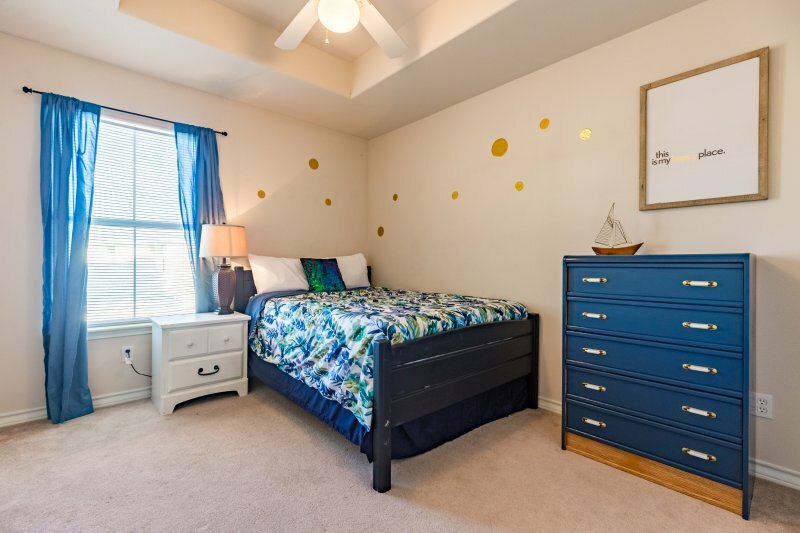 Perfect for kids, the second bedroom comes with two twin-over-twin bunks and a walk-in closet. 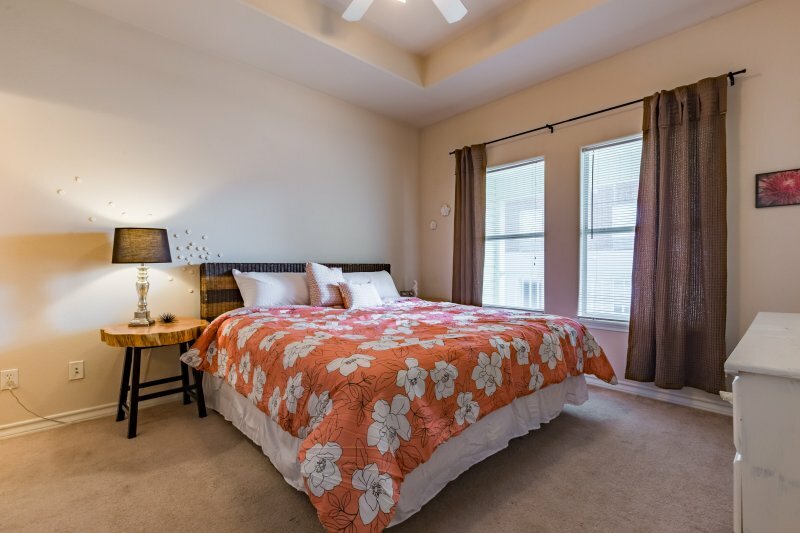 A third bedroom offers a walk-in closet and a full-size bed with a comfy memory foam mattress. A guest bathroom has a tub/shower combination, and there’s also a half bath on the entry level. A queen sofa bed in the living room sofa and a twin day bed and a trundle bed underneath great for kids or adults. Also a pack n play and booster seat are in the unit for our tiny guests! 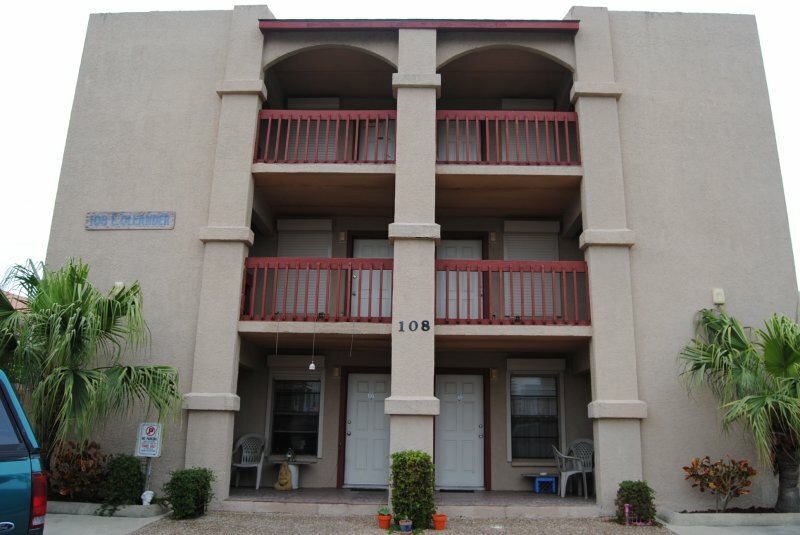 Amenities include complimentary Wi-Fi, cable TV, and a washer/dryer. Parking is available for three cars. THE LOCATION Stroll 10 minutes and perch yourself on the sandy shores of Whitecap Beach. Or drive 7 minutes and spend the morning wildlife-spotting and strolling the boardwalks at Packery Channel Park. Just 8 minutes away, JP Luby Surf Park offers a haven for surfing, kiteboarding, and wakeboarding. While Bob Hall Pier (a 6-minute drive) offers a gorgeous spot to catch the sunset. 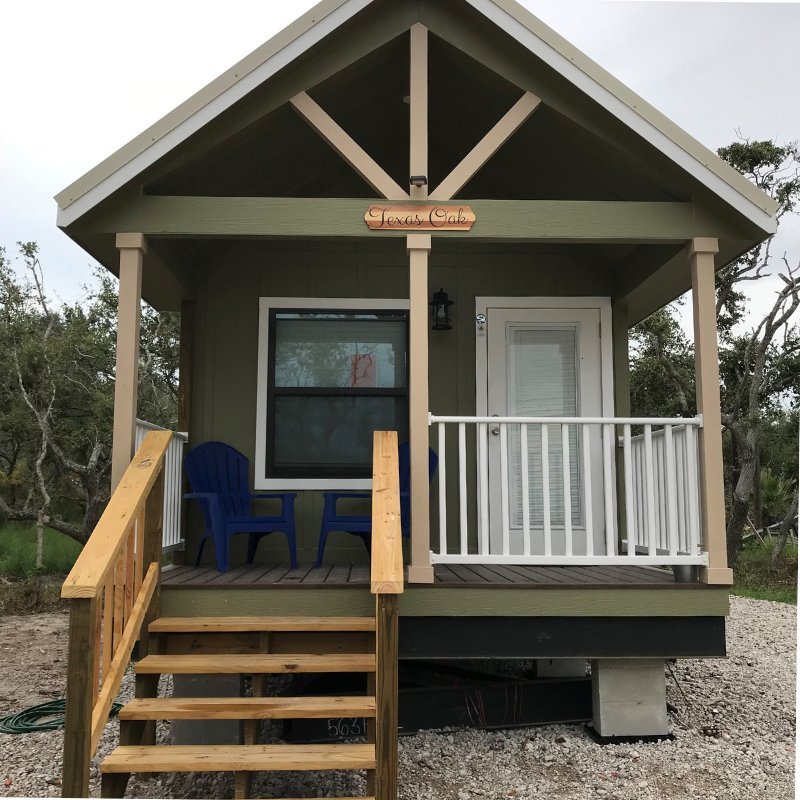 For an adventure-filled day, check out the waterslides at Schlitterbahn (a 7-minute drive) or travel 17 minutes to explore Mustang Island State Park - one of numerous coastal parks in the surrounding area. Local dining options are right on your doorstep. Walk 5 minutes to the waterside sports bar, Boathouse Bar & Grill. Or drive 3 minutes to Costa Sur Wok & Ceviche Bar for Peruvian dishes, seafood and cocktails. JB's German Bakery & Cafe is a great spot for breakfast - also a 3-minute drive. Prices do not include taxes, a damage protection fee (dependent on length of stay $69-$250), and a $145 cleaning fee. Please feel free to contact the owner for last minute discounts and deals. Entertainment System Roku stick for access to Hulu, Amazon video, Sling TV, Netflix, Roku TV. 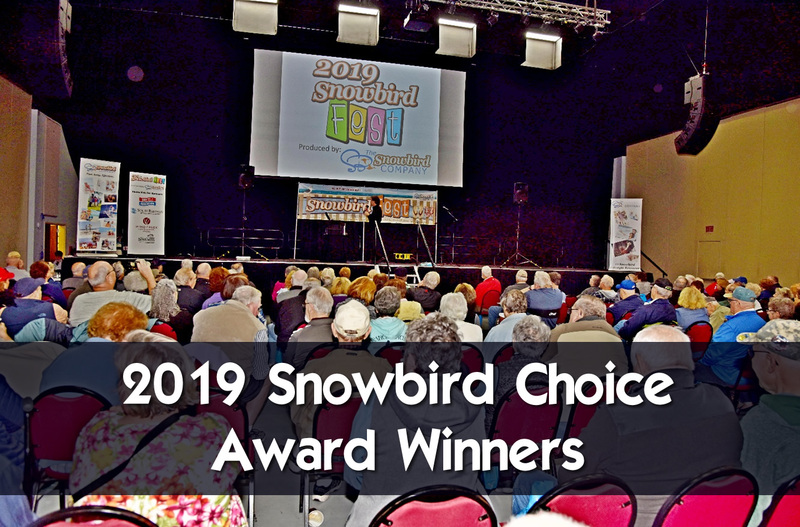 Puzzles, books and games to enjoy as well. Additional Rate Information Not included in rates- taxes, damage protection fee (dependent on length of stay $69-250), and a $145 cleaning fee. Please feel free to contact the owner for last minute discounts and deals. Crib Pack n play with bassinet option is found in one of the upstairs closets.